The central events of Harriman vs. Hill took place 112 years ago—long before the federal government regulated the trading of securities and before it prohibited insider trading and the secret manipulating of stock prices. The Federal Reserve was still a decade away from creation and at the time of this story J. P. Morgan himself served as sort of the de facto central bank for the United States, exerting his considerable influence on the market to guide interest rates. 1. There is a big difference between risky, short-term speculation and patient investing for the long-term. The traders who “shorted” Northern Pacific common stock in early May 1901 were correct in guessing that the stock was drastically over-valued, but they multiplied their risk by making a huge short-term bet that the stock would drop quickly. When the stock, instead, rocketed up many of them lost small, and large, fortunes and had no one to blame but themselves. There is no more painful story in Harriman vs. Hill than that of a pour soul named Theodore S. Baron, whose dire fate I found buried in newspaper accounts of the Northern Pacific panic. On Monday, May 6, 1901, he walked into a brokerage office in New York intending to buy a thousand shares each of Northern Pacific and Southern Pacific. Had he done so he would have been $700,000 wealthier in just three days and even wealthier if he’d held onto those stocks for a lifetime and reinvested their dividends. Instead, he changed his mind at the last minute and decided to short both of them. He lost $160,000, was arrested for trying to pass a bad check to cover his short position and lost his partnership in his dry goods company. 2. There are bargains in the market for those who can spot value in the wreckage. Northern Pacific went bankrupt in late 1893 for the second time in twenty years. Three years later, when Morgan was reorganizing it, one could have bought a share of “Nipper” common for 25 cents. It would have been an opportunistic bet on the railroad’s future value and on the future expansion of the American West. Five years later, on the morning of Monday, May 6, 1901, Nipper common opened at $110 a share. Patience in those ascendant years of the American economy also served investors such as Arthur Orr of Chicago. He bought 10,000 shares of Union Pacific in 1898 for $20 a share just as Harriman and Schiff were beginning to revitalize it during the McKinley boom years. He held on to his Union Pacific stock even though it didn’t pay a dividend much of that time. He believed in the railroad’s future earnings power and Harriman’s magic touch. He was rewarded for his patience and faith. He sold those 10,000 shares on May 2, 1901, at $131 and netted more than $1 million, about $26 million in today’s dollars. 4. I have faith in the inherent, long-term strength of free enterprise capitalism. It’s not perfect but if you find a better model please let me know. All four of the principals in this story—J.P. Morgan, James J. Hill, Edward H. Harriman and Jacob H. Schiff—believed in the wisdom and efficiency of free markets and that free enterprise was, as de Tocqueville said, the “foremost cause” of America’s “rapid progress, its strength and greatness.” Or, as J. P. Morgan used to quote his father, “Any man who is a bear on the future of this country will go broke.” Jacob Schiff came to America as a young man from Germany in the mid-nineteenth century because he saw American free enterprise as the hope of the world. That’s why he proudly flew the American flag and not his company’s flag on the staff atop the Kuhn, Loeb & Company building in the New York financial district. “True Americanism does not mean only to fight for one’s country,” he once wrote, “but also . . . to serve your country in your daily life.” He was one of the most philanthropic Americans of his generation, giving millions to charitable enterprises. On the evening of May 9, 1901—the day of the Northern Pacific panic—Jacob Schiff reportedly was not at his desk at Kuhn, Loeb but delivering meals with his wife, Therese, to the clients of the Henry Street Settlement House on the Lower East Side. 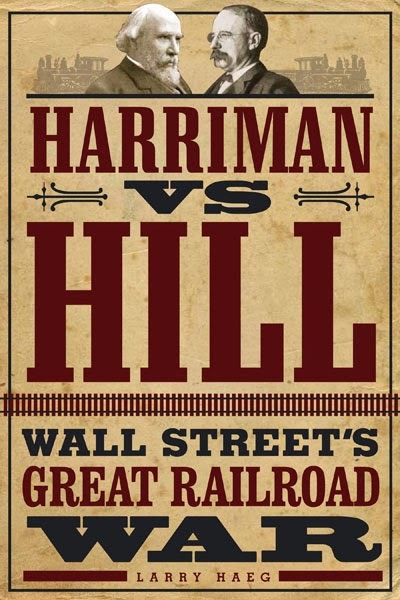 Larry Haeg is author of Harriman vs. Hill: Wall Street's Great Railroad War. He is a former broadcast journalist and former executive vice president of corporate communications for Wells Fargo & Company. "I first read about the Northern Pacific Corner when I was ten years old. When I opened my office on January 1, 1962, I put on the wall a framed copy of the New York Times of May 10, 1901, describing the fateful prior day. Larry Haeg now tells the full story, and I enjoyed every word of it."